Welcome to Liberty 360, a circular theater telling the American tale. The centuries will collide in Philadelphia’s historic district this weekend when tour guides in 18th-century garb welcome visitors to the 21st century and a 3-D theater in the round. David Niles, designer of the well-received video wall at the Comcast Center, is offering a new 3-D attraction dubbed Liberty 360 that opened this week. It’s a 15-minute, sometimes-panoramic show about the iconic symbols of America. The onscreen host is tinkerer extraordinaire Benjamin Franklin – the founding father most likely to be dazzled by 3-D.
Just to dish up this one short, Niles Creative Group designed the circular Peco Theater in the lobby of the new Historic Philadelphia Center near Sixth and Chestnut Streets. For the shows, audiences of 50 to 65 people file up a ramp to a suspended platform surrounded by a 150-foot circular screen. It’s a little like walking into an oversize Gravitron at an amusement park, but nothing shakes, including you. As you stand in the center of the platform, waiting for the show to begin, audience members fiddle with the Buddy Holly-style 3-D frames on their noses, unaware that the lenses employ three layers of gold to filter light. A custom-designed sound system streams original compositions featuring 65 musicians. When the show begins, images from eight 3-D projectors dovetail to display the yarn about the symbols of America. “I think it’s really smart to blend the history with the newest technology because that’s what kids like – the Facebook generation and the video gamers,” says Jill Lawrence of Newark, Del. The show opens with New York actor Charles Edward Hall, dressed and stuffed to resemble Franklin, talking to the audience from a Philadelphia workshop while apprentices toil in the 3-D background and passersby occasionally stroll past on the opposite side of the windows. The designer, who edits video at a stunning 3-D computer monitor in his Manhattan studio, says he wants viewers to be wowed by Liberty 360’s story, not its gizmos. It’s a story with a surprise ending, one that delighted some members of the audience at a preview screening. Liberty 360 opened Wednesday, but this weekend’s showing will feature Historic Philadelphia’s history makers in period costumes. On Saturday and Sunday, called Liberty 360 Grand Opening Weekend, the activities include free face painting and balloon animals for children and an appearance by the Phillie Phanatic at 11 a.m. Saturday. 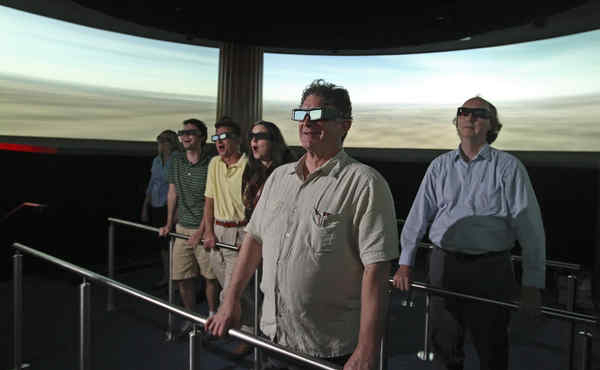 The show is one of two 3-D parts – a new digital outdoor Lights of Liberty Show slated to open next summer will take visitors on a nighttime journey through Independence National Historical Park with surround-sound and 3-D scenes shown on the facades of historic buildings.